← Is the International Criminal Court targeting Africa? Liberian refugees living in the Bububuram refugee camp in the Central region of Ghana will lose their status as refugees by June 2012. The decision which is being implemented by the international community will cut aid supplies to the refugees. According to a Programs Coordinator for the Ghana Refugee Board, Tetteh Padi, the refugees will be forced to integrate if the deadline elapses. “The international community has come together, and this includes the Liberian government, and they have agreed that the conditions back in Liberia are good enough, safe enough for those who fled the war,” Tetteh Padi told Joy News. He said the refugees have the option to regularize their stay in the country with the Immigration Service. The first 95 Liberian refugees arrived in Ghana in 1990 but the number swelled up to 42,000 in 2004 according to a report by the United Nations High Commission for Refugees (UNCHR). However, according to the report, some of the refugees returned to Liberia when the civil war subsided in 2005 and there was a subsequent voluntary repatriation by UNCHR in 2008. During that exercise, over 1000 Liberian refugees left the shores of Ghana for home while others refused to be repatriated insisting on being repatriated to the United States of America instead. 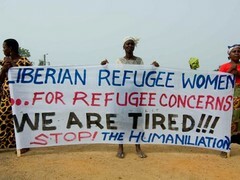 With over 11,000 Liberian refugees living in the West African country currently, the only option left for them is to regularize their stay in the country with that country’s immigration service or voluntarily repatriate to their country because of the stable political situation there now.